Join us for our Earth Day Celebration on April 27! For directions and other info on visiting the farm, see our Get Involved page. It’s time for our annual late winter pond maintenance, and that means interested folks have a rare chance for an up-close experience of the pond under the guidance of local landscaper Brett Stephens. Brett will share knowledge of aquatic plants and pond ecology while the group does some pond cleanup before the arrival of our annual red wing blackbird visitors! Details and RSVP link below. 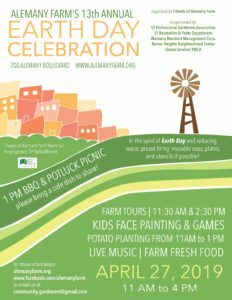 ALSO: Save the Date for Alemany Farm’s 13th Annual Earth Day Celebration on Saturday, April 27, 11 a.m. to 4 p.m. More details in the coming months, but mark your calendars now! Come learn about aquatic plants and water management and help with Alemany Farm’s late winter pond maintenance. The day will include a discussion on pond ecology, the importance of water sources on organic farms, strategies for management and creating plant and animal diversity. Bring your hip waders or rain boots, if you have them (a few will be provided), gloves, snacks to share, and join us in getting your hands wet! After our work in the pond, we will enjoy a light meal/potluck together. Please bring a potluck item to share. Brett Stephens is co-owner/project manager of San Francisco Landscapes. He is certified in permaculture design, a Bay-Friendly professional, ARCSA accredited professional, and a long-time volunteer at Alemany Farm. Please REGISTER in advance so we know you’re joining us! Suggested donation: $5 – $20. No one turned away for lack of funds. Pay by cash or check at the workshop. Saturday, February 9, Noon – 5 p.m.
Monday, February 11, 1 – 5 p.m.
Monday, February 18, 1 – 5 p.m.
Saturday, February 23, Noon – 5 p.m.
For more information about visiting the farm and joining our community workdays, see our Get Involved page. You can also always check our calendar for up-to-date status on workdays. Thank you for your support. We hope to see you soon! Please note that today’s farm workday – Sun, Jan 6 – is cancelled due to the heavy rains. We hope to see you soon at another workday. You can always check our calendar for the status of upcoming workdays. Growing From Here: Support Alemany Farm! In last year’s Friends of Alemany Farm Indiegogo fundraising appeal, we asked “Where Do We Grow From Here?” We were excited to tell you about our recently-hired farm manager, Abby Bell, and our expectations for how our first paid staff position would help us advance our mission in the future. At the end of 2018, we feel we can confidently say simply: We Grow From Here. We’re happy to report that Abby, our farm manager, has been with us for well over a year now, and is helping us build our resilience and strengthen our volunteer ethos to meet the goals we set last year, and to imagine new ones. Consider making a donation to Friends of Alemany Farm to keep our work going in 2019. Covering payroll costs will continue to be our most significant expense. In addition, we still need to budget for basics like seeds, fruit trees, tools and supplies, and other raw materials. Thank you for the many ways in which you have supported Alemany Farm throughout 2018! Take a look at what we’ve accomplished in the past year with the support of our entire community of volunteers, donors, and staff. Over 14,000 volunteer hours this year. That’s an average of over 1,100 volunteer hours per month on the farm or in service to the farm, contributed by many hundreds of people over 52 weeks of the year…and a significant increase over last year. We’re proud of this figure and grateful for what it represents: the beating heart of the farm from which everything we accomplish flows. Together, we grew close to 13 TONS of healthy produce (a 13% increase over last year), all of which is given away for free. As always, this food was provided for free to farm volunteers, farm neighbors, and in sizable weekly food donations to the Free Farm Stand, which provides free produce to individuals and families in the Mission district each Sunday. This year, we also provided produce to supplement the weekly food pantry at the Alemany Public Housing community. A popular new internship program. Our farm manager Abby has created and managed a program that to date has provided training and work experience to over a dozen individuals, many from local schools like SF State, City College of SF, University of SF, and others. Four of these interns have already moved into paid positions in urban agriculture in the Bay Area. The benefit has been mutual: Our interns’ presence has helped shore up our capacity to host community groups, grow food, and do outreach in the area of food security. (And they created our sturdy new row crop signs.) And two interns have transitioned into auxiliary membership in our core volunteer group! Over 160 group visits to the farm in 2018. Field trips and workday farm visits by schools, service organizations, and corporate and faith-based groups. This included adult and youth groups hosted by Friends of Alemany Farm on our workdays, plus over 30 children’s and student groups hosted thanks to our continuing collaboration with SF Recreation & Parks Department’s Youth Stewardship Program. A destination for kids summer programs. Our work on the farm continues to make Alemany Farm a desirable home for summer programs: Sprouts Cooking Club returned to the farm to hold 23 sessions in our outdoor kitchen, and SF RPD hosted 60 children at its second Summer Farm Camp for several weeks. Youth development pilot program. Under the guidance of our assistant farm manager, we hosted three teens from underserved communities for 7 weeks in summer 2018. Each earned $15/hr while learning and working under a dedicated manager, with 3 field trips to working farms to widen their horizons. We hope to expand this program next summer if budget allows. This is one of several of our valuable programs your donation would help support. A revitalized and growing workshop series. In 2018, Abby spearheaded and curated a creative and collaborative workshop series that has drawn over 200 attendees (many of them farm newcomers) to 13 workshops from February through December. New sessions like natural dyes, worm bin composting, and cooking from the farm have joined popular favorites in a series that provides accessible, low-to-no-cost introductions to a range of topics. The series has drawn on the expertise and interests of our own volunteers as well as guest instructors. Look for more learning in the spring! We hope you’ll join us in celebrating what’s been happening here at Alemany Farm in 2018. Many of you helped make it happen, in one way or another, throughout the year. We think here is a good place to grow from. If you’re moved to make a gift to support our growth, please make a tax-deductible donation today to keep Alemany Farm thriving. We value anything you can give, whether that means an afternoon weeding or sowing seeds, or a year-end gift to Friends of Alemany Farm. Thank you, as always, for your work to grow food security and to build community in San Francisco. We hope you have a peaceful year end, and we look forward to working and growing with you in 2019. Winter Fruit Tree Pruning Workshop on December 15! We hope that many of you have made it out to the farm now that our air quality has improved and our community workdays are back in full swing. In case you don’t already know, we’re out at the farm all year long, and winter projects include seasonal fruit tree care. Appropriately, we’re concluding our 2018 workshops with our annual Winter Fruit Tree Pruning Workshop. Come on out and learn about it! Space is limited, so please register in advance at the link below. Learn the basics of pruning fruit trees in this hands-on, interactive class! We’ll walk you through everything you need to know to understand how to maximize your tree’s potential for abundant fruit. We’ll focus on winter pruning, do a demonstration, and then allow you to do some hands-on practice on Alemany Farm’s very own apple and plum trees. We’ll discuss other fruit trees depending on the interest of the participants. Nick Hoff has been a member of the Friends of Alemany Farm since 2011 and helps steward the farm’s 150 fruit trees. Hannah Shulman holds a bachelor’s degree in Growth and Structure of Cities with an Environmental Studies concentration from Haverford College and studied at the Center for Agroecology and Sustainable Food Systems at UC Santa Cruz. Previously, she was a garden educator with Urban Sprouts, GFE, and 18 Reasons / BiRite Market, and ran the first urban agriculture program for the city of San Francisco. She is now the Senior Director of Programs at Education Outside. Our workshop series offers both farm newcomers and regular volunteers a chance to deepen your knowledge, explore a new skill, or pick up some tips and ideas you can apply in your own garden or kitchen. Suggested donation is $20 per person; no one turned away for lack of funds. All donations will benefit Friends of Alemany Farm via our fiscal sponsor, the San Francisco Parks Alliance, a 501(c)(3) nonprofit organization. For more information about visiting the farm and joining our community workdays, see our Get Involved page. Unfortunately, due to the continued very poor air quality from northern California wildfires, we are cancelling the Sunday, November 18 volunteer workday. Please check our calendar to learn the status of our regular Monday workday. Also note that we have a scheduled closure on Saturday, November 24 for the Thanksgiving holiday weekend. We’re thankful for your support, and we certainly look forward to seeing many of you as we head into December. By the way, if you’re looking for indoor activities, our friends at CUESA have one coming up on Monday, as they conclude their Future of Food series. Learn more and get tix at The Future of Food: Subversive Economies. Wishing you a safe, happy, and healthy Thanksgiving. Farm Friends: Please note we will NOT have a workday on Monday, November 12 due to the continued very poor air quality from northern California wildfires. Our next scheduled drop-in workday is Sunday, November 18. We are hopeful that we will have fresher air and clearer skies by that time, so we can have a safe and healthy workday. You can always check our calendar for updates on workday status. Please join us on October 20 – this is a favorite day to spend some time at the farm with friends old and new. Alemany Farm is hiring a part time Assistant Farm Manager and Youth Development Program Lead. Learn about the position below. Please feel free to share with your networks, or apply yourself if you think you are a good fit! Friends of Alemany Farm manage the horticulture, volunteer, and educational programs at Alemany Farm, a 3.5 acre organic farm ecosystem in southeast San Francisco. Our mission is to grow food security and educate local residents about how they can become their own food producers. Together with hundreds of volunteers we grow more than 24,000 pounds of organic fruits and vegetables annually, all of which is given away for free. It is the largest food production space in San Francisco. Take part in organizing, preparing for, and running at least three work sessions per week. Each session includes assisting in the management of farm interns and volunteer groups of 8-35 people. Oversee the continual development and implementation of a part-time job training program targeted at teens and young adults living in the adjacent Alemany community, building on an existing program & relationships. Create a safe learning and professional environment for program participants. Develop and teach relevant curriculum, expectation requirements, scheduling, and accountability structures for successful job training program at Alemany Farm. The youth program both has some dedicated hours, and some program hours overlapping with work session duties. Liaise with other groups active on site, and with SF Rec & Parks Dept. Participate in monthly evening meetings of the Friends group. At least 2 years’ experience in small-scale organic food production or urban gardening; including but not limited to: crop planning, crop maintenance, composting, greenhouse management, and irrigation. Experience managing groups of 8-20 people, preferably in an outdoor or farm setting. Demonstrated ability and/or experience working in communities with high risk of stress and trauma. Knowledge about and commitment to social and racial justice, particularly issues around resource equity in San Francisco’s communities. Ability to act as a role model and demonstrate appropriate work ethic and behavior. Capable of working in a fast-paced outdoor environment. Ability to lift 30 pounds from floor to table height. Strong skills in interpersonal communication, collaboration, and emotional intelligence. Self motivated, demonstrating ability take initiative. Value and ability to work and think collaboratively. Please send cover letter and resume (as one .pdf file) to Abby Bell, Alemany Farm Manager: alemanyabby@gmail.com. Please include in the subject line, “Assistant Farm Manager Position”. Applications are accepted on a rolling basis. Position is open until filled. The Friends of Alemany Farm is a project of the San Francisco Parks Alliance. Friends of Alemany Farm is an Equal Opportunity Employer and encourages candidates of all backgrounds to apply for this position. Picking & Pruning Workshops this Weekend! Our Fall Workshop Series continues this coming weekend with two workshops: the return of our popular pickling and fermentation session for a different season, and an introduction to summer fruit tree pruning. Please register in advance, and feel free to share with your networks. There is a suggested donation of $20 for our workshops, which benefits Friends of Alemany Farm via our fiscal sponsor, the San Francisco Parks Alliance. Come learn all about making your own pickles at home! In this hands-on workshop, you’ll learn about the basics of pickle making, both with vinegars and natural fermentation, and tips you need to know to make sure your pickles are safe, crunchy, and delicious. At this workshop, you’ll make your own jar of cucumber dill pickles to take home for fermenting on your own. This workshop will be taught by the SF Rec and Park Dept’s own Urban Agriculture Program Manager, Mei Ling Hui, who volunteers as a Master Food Preserver. Mei Ling Hui leads RPD’s community garden and urban farm programming, and has been volunteering as a Master Food Preserver since 2014. She has taught workshops all over the Bay Area, including at the San Mateo County Fair and Maker Faire. Mei Ling is also the Co-Chair for the Preserves Committee of the Good Food Awards, which honors the outstanding American food producers that push their industries towards craftsmanship and sustainability while enhancing our agricultural landscape and building strong communities. Space is limited so please register in advance. Please bring your own cutting board and knife. NOTE that there is an additional $10 material fee for this workshop. While common wisdom holds that most fruit trees should be pruned in the winter, vigorous and large deciduous fruit trees can also benefit from summer pruning. Come learn about the basics of when, why, and how to summer prune apples and plums at Alemany Farm, and get hands-on practice as well. This class will focus on the essentials of summer tree care, including pruning methods, pruning timing, and orchard hygiene. A quick refresher will also cover tree biology basics needed to understand how pruning works in general, which will help us as we demonstrate and practice what we learn in the field. Jason Mark is a co-founder and volunteer co-manager of Alemany Farm. We thank Google for generously sponsoring the Friends of Alemany Farm Fall 2018 Workshop Series. We hope to see you at an upcoming workshop or community workday. Can't make it to the Farm but still want to pitch in -- or been enjoying Alemany and want more ways to help? Make a tax-deductible online donation, or send a check to our mailing address (made payable to SFPA with "FoAF" in the memo line). The Friends of Alemany Farm are grateful to have the support of our fiscal sponsor, the San Francisco Parks Alliance.